I’ve always had a thing for hallways – it’s the first thing people see when they enter your home and so I think you should aim to create a space that is interesting and makes a lasting impression. I’m drawn to bold designs, with quirky features – and my latest obsession is fun doormats! It’s a cheap and cheerful way of making a super quick update to your entrance way, plus everyone needs a doormat / flower shot on their Instagram feed don’t they?? Firstly, this lovely French style mat by Bombay Duck would be sure to brighten up any hallway! I’m sure I’m not the only one that can relate to this, if you’re guilty of hiding a parcel or two, then this is the door mat for you! Or lastly, how about this Home Alone inspired mat – perfect for Christmas or really any time of the year! A little while ago I changed my living room gallery wall to one big single print, and as much as I loved the print, it just didn’t feel right – it didn’t quite fit the space and just looked too minimalist for me. So imagine how happy I was when Desenio got in touch to see if I would be interested in collaborating on a new gallery wall!! Desenio has the most amazing selection of prints, from beautiful art prints to the most stylish photographic designs, I apologise now for the lost hours you will spend browsing through the site! I know I have lost A LOT of time this way! They also have an incredible Inspiration Gallery so if you’re feeling a bit stuck, I recommend having a look through at some of their fabulous set ups! So where do you start with a new gallery wall? I find the easiest way is to choose one print first and build up from there. As I was starting a fresh with this gallery wall, with all new prints and I didn’t have any particular theme in mind, I began by simply browsing to see what caught my eye. Straight away I was drawn to the Studio Stockholm Collection and the lovely pastel shades. I eventually chose the Stockholm Riddarholmen Poster as I felt the red brick and mustard colours would tie in nicely with my living room, and decided this would be my starting point. Also from this collection I chose the Stockholm Door Poster as I just couldn’t resist that beautiful blue! Another print that I had actually had my eye on for a while was this lovely, calming Boathouses Poster. Looking at the colours I decided it would sit perfectly alongside the other two that I had chosen. For my last gallery wall I just made it up as I went along, and I think that’s perhaps why I was never fully happy with it. So for this one I made a plan. I used an online mood board creator to play around with the layout of prints to ensure that I chose the right sizes and that the prints complimented each other. After some back and forth I planned the layout of the three designs that I had chosen and decided I needed perhaps two more prints both of which needed to be quite paired back and simple. I had recently included this Hide Poster in a client’s brief and thought it was just the thing that my gallery wall needed. Finally, I chose this black and white Boat Poster in a small size as the finishing touch. Here’s how the plan looked on my mood board. And here’s how it looked on my wall! I just love how it fills the space and all the designs work so well together, a bit of planning and a lot of searching paid off! In fact I’ve fallen for the blue in the door poster so much I’ve decided to add other elements of it into the room so have been on the hunt for some accessories to match! Whether your a fan of the gallery wall sort or prefer the look of just one or two pieces of art, I really cannot recommend Desenio enough – there is something for everyone and not only that but it is the most affordable place to buy art that I know of! For a short time you can also save further by using my very own discount code. The code “overatkates” gives 25% off posters* between May 1st and May 3rd. Autumn / Winter is my absolute favourite time of year! I love nothing more than being cosied up at home in front of the fire with a blanket and a cuppa. It’s around this time that I start to add a few Autumnal touches into my home, and so for this post I have collaborated with Wayfair to show you how I’ll be getting ready for the cosy season. To me, Autumn / Winter means texture, deep, rich colours and metallic accents – bits that will see you right through from the first hint of Autumn until the festive season and beyond! I’ve talked before about how I feel that rugs really ‘finish off’ a room. By adding a rug (particularly one with some texture) you can transform your room from cold to cosy in an instant! I’ve opted for this gorgeous Theko Handwoven Sheepskin rug. Something I always do at the start of every new season is swap out my cushions. So my colourful summer cushions will be stashed away to make room for knitted, cosy ones in rich tones. These two by Kilburn and Scott in deep Autumnal shades are perfect, and who can resist anything with a bit of pom pom detail. Another A/W must have is of course a cosy throw! This faux mohair style is super soft and was made for snuggling up in front of the fire. And of course, no cosy scene is complete without candles! What will you be buying to get your home Autumn / Winter ready? You don’t have to have seen too many photos of my home to know that I absolutely love a bit of gold!! It’s the perfect accent to, I think, all colour schemes! From the dark blue in my dining room to the pastel pink and grey scheme in my bedroom, I can’t resist a gold accessory or two. 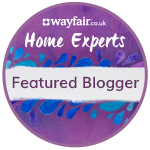 So it’s no surprise that I was just a tad excited about the latest Wayfair Home Expert Challenge which was to style one of three fabulous Safavieh gold side tables! It just so happens that I have been after the perfect side table for my living room for quite some time. When we first moved in I put two upturned crates in the corner just so I had somewhere to put my cuppa. Two years later and they were still there! They bugged me every time I looked at them, they were just far too ‘rustic’ for the look I was going for. I wanted something more striking and elegant. Enter this beauty from Safavieh at Wayfair – isn’t she gorgeous?! Simple but striking, it was love at first sight! I chose to style my table with this fabulous House Doctor vase and some giant faux hydrangeas, both also from Wayfair. What do we think?! Slightly better than the crates, right? For more gold table inspiration check out these images from Pinterest below. Gorgeous or what?! This post was sponsored by Wayfair and Safavieh but the words and opinions are 100% my own.